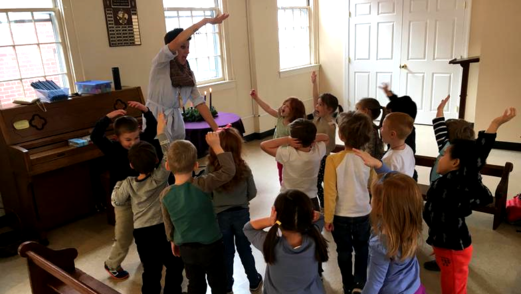 Every week the children attend music class with Ms. Heather. 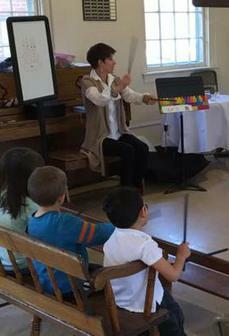 In Music Class, the children meet a new Composer each month as well as learning a new music term. Songs taught in Music Class reflect our classroom themes, chapel lessons and seasonal favorites. The children enjoy sharing the songs they learn during Special Chapel each month. The children go to chapel once a week with Ms. Heather. There are interactive lessons for the children to learn more about how God works in their lives. The children learn a verse each month. Parents are invited to attend a Special Chapel session once a month to experience chapel along with the children. The classroom teachers conduct movement classes with the children to work on gross motor skills. The children learn a variety of games that will help them improve on their gross motor skills. ​Every Tuesday and Wednesday parents can choose to sign their child up for Lunch Bunch. There is an additional fee of $10/day for lunch bunch. Each child brings a lunch and after they have eaten they play indoors and out when possible. This is a great opportunity for parents to have a little extra free time. The children enjoy the time to be together. Lunch bunch ends at 1:30 PM. The children play on the playground every day, weather permitting. We have a multi-purpose room to play in during the winter months. Our Fabulous Friday Frogs enjoy an exciting morning where they explore, create and learn about a variety of topics that we don't always get to during the school year. Our Fabulous Friday teachers go the extra mile to make this a hands on learning experience for our Frogs. The Enrichment Fridays will allow your 4-year-old to attend preschool 5 days/week. There will be 16 children and 2 teachers in the class. **Your child must first be registered in the M-TH 4's program in order to enroll in Enrichment Fridays. If we do not fill the class with 4's we will open this class up to the T/TH 3's students.